ក. The .eu domain is also used, as in other European Union member states. 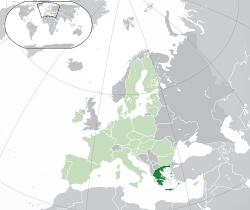 "Greece", [Expression error: Unrecognized punctuation character "១". Encyclopaedia Britannica], http://www.britannica.com/place/Greece . "Greece", [Expression error: Unrecognized punctuation character "១". Traveler] (guide), National Geographic, http://travel.nationalgeographic.com/travel/countries/greece-guide/ . "Greece", UCB Libraries GovPubs, Colorado, http://ucblibraries.colorado.edu/govpubs/for/greece.htm, បានយកមក 2016-03-23 . "Greece", BBC News (UK), 25 December 2013, http://www.bbc.co.uk/news/world-europe-17372520, បានយកមក 2016-03-23 . Greek Council for Refugees, http://www.gcr.gr/, បានយកមក 2016-03-23 . Hellenic History, GR: FHW, http://www.fhw.gr/chronos/en/, បានយកមក 2016-03-23 . Hellenism, http://www.hellenism.net/, បានយកមក 2016-03-23 – Everything about Greece.